The spot where counter protester Heather Heyer was killed when a car plowed down a street during the Charlottesville protest last year has become an unlikely space of refuge for her mother. 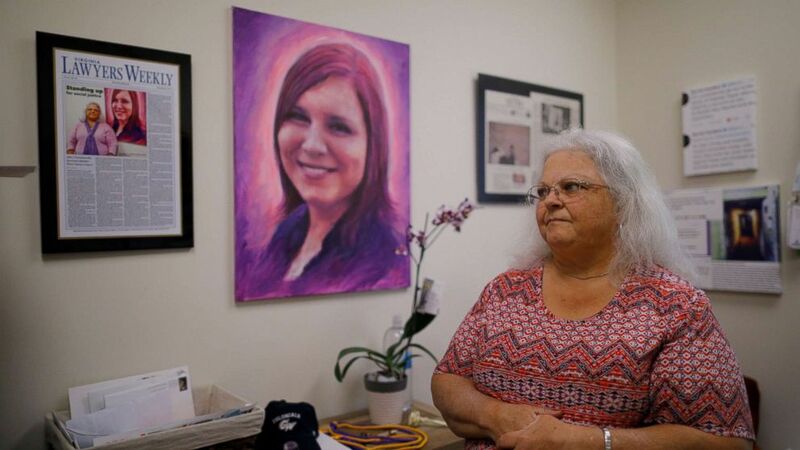 "This is where I feel a connection to Heather," Susan Bro said while visiting that area on 4th Street, now renamed "Honorary Heather Heyer Way," with ABC News' Eva Pilgrim. Bro noted that Heyer "is with me all the time" but "this is where she was taken from me." "Sometimes I come in the evening ... to sort of commune with the energy that's here," she said. Bro is speaking out ahead of the upcoming anniversary of the white nationalist rally in Charlottesville, Virginia, when Heyer, 32, was killed on Aug. 12. Events are slated to be held in Charlottesville this weekend. Law enforcement officials have already released public guidelines and the governor of Virginia has already called for a state of emergency to be in place. "Maybe we're in a little bit of overkill with the police state coming, maybe not. It is what it is," Bro said. "I'm moving forward and we're trying to make the world a better place. Either get on board or get out of the way," she said. In an interview for ABC News' "Start Here" podcast, Bro said that she has turned to activism instead of "dwelling in hate or anger." "I think if we don't focus on fixing the issues that caused this in the first place, the racial divide in our country, then we're going to be right back at Charlottesville in no time flat," Bro told "Start Here." The heartbroken mom said she's spoken to "hundreds of thousands of people" about how to address these issues, adding that she was surprised by the number of people who were determined to take a stand when they heard stories about her daughter. "I've had conversations with many people that I've never met, who've simply listened to something that I've said, or read about Heather's life, or heard about what's going on, and they say they're standing up and speaking out now." Ahead of the anniversary of Heyer's death this weekend, Virginia Gov. Ralph Northam, in declaring the state of emergency, asked Virginians to "make alternative plans to engaging with planned demonstrations of hate." There are small memorial events planned in Charlottesville, but police in Washington, D.C., are preparing for any fallout from a planned "Unite the Right" parade and rally. Bro said she believes any counter-protesters will be "a little more wary and cautious" after seeing what happened last year in Charlottesville, but she insisted that ignoring white nationalist groups is not the answer. They "crave silence or violence," she said. Instead, she's calling for loud, non-violent resistance. "If we ignore them, they think they have won because they have had the ... playing field all to themselves. If we give them violence, they believe they have won because they have pushed your buttons and maybe taken out a few." This story is featured in Friday's edition of the ABC News "Start Here" podcast. "Start Here" is a daily ABC News podcast hosted by Brad Mielke featuring original reporting on stories that are driving the national conversation. Listen for FREE on the ABC News app, Apple Podcasts, TuneIn, Spotify, Stitcher, Google Play Music, or iHeartRadio. Ask Alexa: Play Start Here, or add the "Start Here" skill to your Flash Briefing.